Maureen Correll cuts the motor and the aluminum boat glides to the shore as California and ring-billed gulls overhead loudly announce the arrival of trespassers. Crescent Island near Wallula is a scraggy bit of land, barely higher than the waves, created 25 years ago with spoilage dumped from dredging the Columbia River channel -- suitable for birds and little else. A short walk through brush and Russian olive trees reveals a blind where Correll, an avian ecologist from Oregon State University who is the team leader, and other observers come often during the summer to watch Caspian terns catch and feed juvenile chinook salmon and steelhead to their young. The colony of about 300 nesting pairs of terns will consume hundreds of thousands of young fish from the river in just a few weeks of the breeding season. Correll and her team are able to tally how many fish are taken by collecting PIT tags -- rice pellet-sized microchips implanted in hatchery fish to help track their movements. (The name stands for passive integrated transponder.) The tags end up in the feces that coats the breeding grounds. The bird observers are field soldiers in research by the Walla Walla District of the Army Corps of Engineers that began in 2003 to assess how much impact avian predators such as Caspian terns and double-crested cormorants have on juvenile salmon and steelhead. The cost of the research this year is $686,000, with an option to renew the contract annually through 2012. Terns typically bring fish to the nest to feed to their young, while cormorants eat their catch right away and then regurgitate it later, partially digested, to their young. The terns on Crescent Island migrate south in the winter, but the cormorants have established themselves as year-round residents. Scott Dunmire, a fish biologist with the Corps, said there were only a few cormorants on this part of the Columbia River in the early 1990s, but there now are 308 nesting pairs on an island up-river from Wallula Gap. Terns hover above the water and then shoot down with amazing accuracy, coming up with a shiny silver fish about one out of three attempts. And they seem to prefer fish about 6 inches long -- the size of juvenile salmon or a steelhead, which are collectively called salmonid. "This tern colony has a high number of salmonid in its diet," Dunmire said. The research is helping gauge how many juvenile fall chinook and young steelhead migrating to the ocean in the spring end up as tern food. Tagging specific fish species gives researchers information they need. While terns can subsist on many fish species, they feed mainly on Columbia salmonid, and are known to target juvenile steelhead because they swim closer to the surface than other fish, Dunmire said. Corps' biologists tag the fish at Ice Harbor and Lower Monumental dams when they are about 2 inches long. Electronic monitoring stations placed strategically in the river detect the tags as the fish move down the river, so researchers can determine how many of the fish go missing. The tags in bird feces on the island show how many were eaten by terns. Tags at tern nesting sites on the barren ground are relatively easy to locate electronically, but tags from cormorants, which nest in trees, are harder to find. Some cormorants must be killed so necropsies can be done to recover the tags. Back at the lab, the history of each recovered tag can be revealed: When it was implanted, where and when the fish was detected in its travels, and the last time it was known to be in the water. Knowing what the terns' caloric needs are and counting the size of the colony yields a bioenergetic model the biologists can use to assume how much food the birds consume. The tag count tells how much of that was salmonid. Dan Roby, associate professor of fisheries and wildlife at Oregon State University, has been using this model for more than a decade to analyze avian predation. 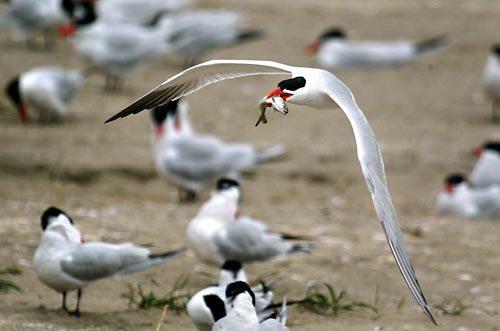 Roby told researchers at a recent avian predator conference in Kennewick that the research shows Crescent Island's tern population has been living on an intake of about 70 percent salmon and the remainder mostly bass and sunfish. He said researchers estimate 500,000 salmon smolt a year are being consumed by the Crescent Island tern colony. By comparison, a much larger tern colony in the river estuary takes about 5 million salmon and steelhead each year, although that comprises only about 30 percent of that colony's diet, Roby said. How big a bite is all this on the Columbia's salmon stock? Researchers can only estimate how many salmon smolt there are in the river. "That's the $64,000 question," said Roby, but in a 1998 avian predation study he said the loss of salmonid to terns could be as high as 15 percent for the entire river system. The Corps' study will provide data to guide decisions on whether the terns are a serious enough threat to salmon to require action, Dunmire said. Knowing how many fish the terns consume is important in the big picture for salmon recovery on the Columbia River. If significant enough, it could trigger a shift in priorities for salmon recovery efforts. For instance, instead of solely concentrating salmon recovery efforts on getting fish past hydroelectric dams, making habitat improvements and trying to balance river flows with needs for farmers and power generation, some of those resources could be directed at avian predators. 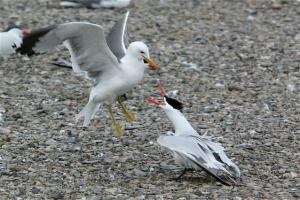 "The question is can we live with the (tern) predation level or is management warranted?" Dunmire said. What Correll's team discovers will be vital to both fish and the terns. By "action," Dunmire doesn't mean killing terns. The federal Migratory Bird Treaty Act of 1918 protects Caspian terns, while the Endangered Species Act protects the fish. "We've got a conflict here with the MBA and the ESA," he said. One option is to transport juvenile fish by barge down the river and past the bird colonies. Another possibility is to convince the terns to go elsewhere. Planting vegetation on a beach where terns nest could persuade the birds to move on because they prefer an open area with sandy soil for nesting. The Corps' latest experiment is a floating island that was installed in southeast Oregon in March. Only eight nesting pairs of terns have set up residency there, but after just three months it is too early to declare success or failure, said Amy Echols, a Corps spokeswoman in Portland. Some Crescent Island terns also appear to be moving north to Goose Island in the Potholes area of Grant County where there are about 440 nesting pairs, said Roby. Having suitable nesting habitat and a food source that is away from Columbia River salmonid is the key, he said. Food and habitat aside, birds also may move on because of intruders, such as the gulls on Crescent Island. "Gulls are the bullies of the colony. They steal fish, chicks and eggs," Correll said. A grid of strings staked out on the sandy soil helps researchers count birds, nests and observe how often gulls harass the terns. Gulls move about boldly, taking what they want almost at will. Correll and Dunmire also keep tabs on a crested cormorant population that dominates Foundation Island, which lies a little up-river across from the Boise paper mill. Foundation Island is larger than Crescent Island and well-treed. But it's not easily approached by boat, so Correll's team has set a blind on a platform staked in shallow water about 150 yards offshore. Trees with cormorant nests are easy to pick out because they are naked and white, poisoned by the birds' highly acidic guano. Roby said Foundation Island's cormorant colony is the second-largest of four in the Columbia Plateau, with the 800 nesting pairs at Potholes being the largest. Colonies at Okanogan and Sprague Lake have 30 to 40 birds each. While much larger than terns, cormorants are efficient underwater fishers. They dive deeper and can have a more varied diet that includes shad. Necropsy analysis has shown about a third of the cormorants' diet is salmon or steelhead, with the remainder an equal amount of black bass, bluegill and crappie and a mix of catfish and other prey, Roby said. But Foundation Island's cormorant population of 308 nesting pairs has been growing. Dunmire is concerned that at some point they may be a bigger threat than the terns because they are more flexible in their habitat and have started to stay during winter. "Ten years down the road, I think cormorants will be a bigger concern for us," he said. "Balance is the key. What is it and how do we maintain that balance?" Dunmire said. Also under observation, but informally, is a colony of American white pelicans on Badger Island, which is between Crescent and Foundation islands. They also take Columbia River salmon, but so far don't appear to be having nearly the impact that terns and cormorants do, Dunmire said. Roby said the pelican population on Badger Island was believed to be just 40 in 1998 but is now estimated by aerial survey at 1,200. "It stands to say they have done fairly well," he said.